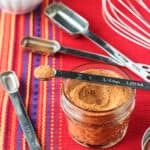 Feel the heat with this dry buffalo spice mix! It’s customizable to your tastes and is great on chicken, vegetables, eggs, and more! Combine all ingredients in a bowl. That's it! This spice mix packs a moderate heat. Decrease the cayenne if you'd prefer a less spicy spice blend.